The traditional LAN design is a single drop of copper cable pulled from the wiring closet to every device on the network. Considering the 100-meter distance limitation of copper cabling, for most buildings, more than one wiring closet is usually required to connect all users. 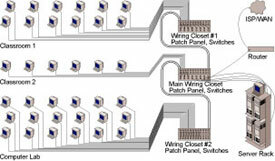 Fiber cabling is usually used as a backbone to connect wiring closets. ©2011 Waters Network Systems. All rights reserved. Zone cabling is a proven solution that reduces infrastructure costs while providing high bandwidth and flexibility to all network users. 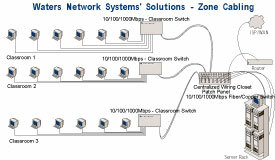 Zone cabling consists of a single cable drop (copper or fiber) installed to a switch on the network edge in each work area, such as a classroom, lab or office cubicle, which then connects directly to a computer or peripheral device. Future growth is easy with zone cabling as new workstations can be added without installing additional cabling. For more information on Zone cabling, visit the Fiber Optics LAN Section at www.fols.org. Cost of fiber cable and associated labor has dramatically been reduced in the past five years. Now that most installers are comfortable with fiber, installation has become efficient and cost effective. Fiber switch ports are still more expensive than copper switch ports. However, since you are saving money by not installing multiple drops of copper and multiple wiring closets, your total infrastructure cost will be reduced. We have delivered fiber based "Zone Cabling" solutions to customers throughout the US for more than twelve years. We offer more than 100 various models of small, compact switches for network edge applications. Our ProSwitch® Secure series continues to be the product of choice for K-12 classrooms. For wiring closet applications, our ProSwitch®-2600M and GSM-2824 switches have redefined low-cost ownership for fiber-based LANs. Looking to stretch your technology budget and reduce spending, simply contact our Technial Support Center at 800.441.5319 to determine which LAN solution will best fit your needs. For additional information about Waters, see About Waters.